I’m currently reading A Renegade History of the United States by Thaddeus Russell and he writes a lot about how the New Deal was based on the same ideas that the Fascists and Nazis had. If you did not read the book, just think of Hayek’s Road to Serfdom. It got me thinking about how the “antifascist” trend is still alive within the punk community today. It seems silly. I doubt that the average punk can even define fascism, and if they did, I don’t know why they would be opposed to it. Fascism just boils down to centralized control of the economy. So many punks take on the appearance of being “working class” by wearing Doc Martens and Fred Perry. Surely they would approve of government funded land projects like the ones done by the WPA. Anyway, this has been your “liberals are hypocrites” thought for the day. I think that’s true and I think that anti-fascist trend has been around for a while at least since DKs did Nazi Punks F*ck Off! This is really just connected with misperceptions that communism and fascism are different when really its is all just the same collectivism, and always ends up with the same result. I only retired my mohawk and boots when I entered the USMC. I am still “antifascist”. Many punks know exactly what fascism is and have read the fascist manifesto. This is exactly why there was a large punk presence in both Occupy Wall St and the TEA Party protests. The big issue here is that most libertarians and anarchists do not realize that they have more in common with the left than the right. With the left, our only difference is one of economics really. They’re keynesian, and we’re austrian. The right approves of the use of force in general and in all things. The right believes that you can change people’s hearts and minds through the use of force. The right thinks the USA should nuke the Near East (I have heard this quite a bit). 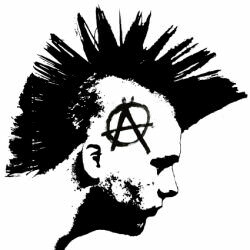 There’s a little punk in everyone in the liberty movement imho.